Where's My Glow? : ROCKabye Baby! As far as I'm aware, there is no record of a parent being driven to homicide due to the constant tinny musical sounds emanating from their children's toys... removing batteries and saying that its broken is a different story all together. Parents (and their friends) have even been know to use a toy for their own amusement, like the Leapfrog Alphabet Caterpillar that stops you sounding out swear words with an interjected “That tickles!” - damn you programmers! So to combat the future insanity I was almost certainly facing, a few good friends have come to the rescue. I've received a 'best of' CD from Rockabye Baby Music... and I'm already in love and half asleep thanks to the soothing tunes! 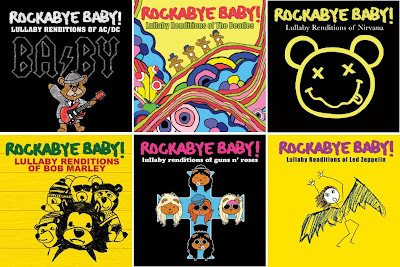 Rockabye Baby turns the music you love in to music that your baby will love – by recording instrumental versions using vibraphones, bells and glockenspiels! Oooh tinkly goodness! Some of my favourites so far are Bohemian Rhapsody by Queen, Good Riddance by Greenday and Stairway to Heaven by Led Zeppelin, but also covered are hits by Metallica, Queens of the Stone Age, The Beatles, No Doubt... the list goes on! Little Tricky will be rockin' out by the time he's two. I spent ages trying to remember where I'd last heard Good Riddance...and then I remembered it was the theme music to our year 12 graduation!